The West Linn softball team made an impact. No, the Lions didn't win the Three Rivers League title this spring, but they impressed the rest of the league's coaches enough that they took two of the TRL's top awards, landed two players on the all-TRL first team and had eight honored in total. 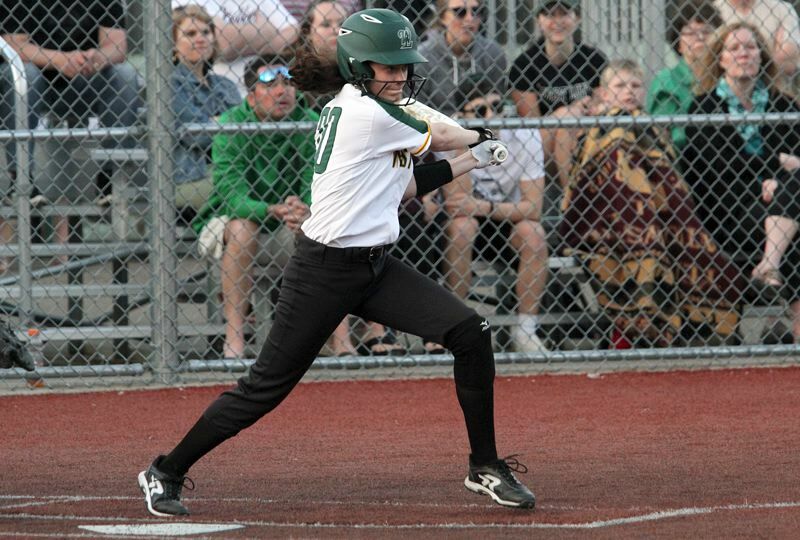 As to those premier awards, West Linn senior outfielder Brooke McKelvey was named Three Rivers League Player of the Year after leading the Lions to an 8-6 league record, a tie for third place and a berth in the Class 6A state playoffs. "Brooke is fast and reads plays in the outfield very well," West Linn coach Monica Sorenson said of McKelvey, the team's leadoff hitter and a player who will suit up next year for Carleton College in Minnesota. "She has a calmness and confidence that helped her get the batting average she has. She can bunt or hit for base hits (and she's) a great teammate." The other big award that went to West Linn went to Sorenson herself — she was named TRL Coach of the Year for 2018. Her Lions hit the ball up and down the lineup, managed to take one game off second-place Tigard, played unbeaten eventual state champion Tualatin to a near standstill once and then bowed out in the first round of the Class 6A state playoffs to Sheldon. Also earning first-team all-TRL honors was Harvard-bound senior infielder Kaitlyn Lampson. Lampson, a co-captain for the second straight year, played first base, second and shortstop this season, batted third or fourth in the lineup and used her speed to great effect on the bases. "(She was) great at hitting in runs … has an amazing knowledge of the game and knows how to motivate the team at the right time," Sorenson said. "(She was) a natural leader." Also honored from West Linn were six second-team selections: senior outfielder Megan Talbert; junior pitcher Lexi Finke; junior infielder Taylor Maxwell; senior infielder Avery Esau; and senior catcher Weston Miller. Sophomore Lexi Grein was selected to the Honorable Mention Team. Tigard senior Ashley Davis was named Pitcher of the Year for the TRL. Outfielders: Lexi Klum*, so., Tigard; Brooke McKelvey*, sr., West Linn; Claire Johnston, sr., Lakeridge; Zoe Olivera, sr., Tualatin; Sophia vanderSommen, fr., Tigard. Pitchers: Ashley Davis*, sr., Tigard; Megan Woodward, sr., Tualatin; Tia Ridings, so., Tualatin. Infielders: Taylor Alton, sr., Tualatin; Morgan Jones, sr., Lake Oswego; Emily Johansen, jr., Tualatin; Kaitlin Lampson, sr., West Linn; Cassidy Posey, sr., Canby; Sara Nyland, sr., Lakeridge. Catchers: Emily Paulson*, so., Tigard; Ella Hillier, sr., Tualatin. Utility Player: Olivia Dirks, so., Sherwood. Outfielders: Megan Talbert, sr., West Linn; Sam Teran, jr., Newberg; Savannah Tuli, sr., Canby; Layney Lombardo, jr., Lake Oswego. Pitchers: Lexi Finke, jr., West Linn; Parker Allhands, jr., Canby. Infielders: Taylor Maxwell, jr., West Linn; Kamryn Mobley, jr., Canby; Maddie Hoover, jr., Tigard; Avery Esau, sr., West Linn; Zimri Lemonds, jr., Newberg. Catchers: Emily Watson, sr.; Sherwood; Weston Miller, sr., West Linn. Utility Player: Gracie Hook, jr., West Linn. Outfielders: Ruby Kayser, so., Canby; Rachel Opferman, fr., Lakeridge; Nicole Michleson, so., Canby. Infielders: Bella Valdez, so., Tualatin; Emily Hewitt, sr., Canby; Bailey Shorter, sr., Canby; Giselle Benetti, jr., Newberg; McKenzie Plummer, sr., Newberg; Marin Penney, jr., Lake Oswego; Caroline Riggs, sr., Tigard; Lexi Grein, so., West Linn; Andrea Gomez, jr., Tualatin; Sailor Mickey, sr., Lakeridge; Anna Tomita, sr., Lake Oswego. Pitchers: MacKenzie Nelson, fr., Lakeridge; Jayden Yoder, sr., Newberg. Utility Players: Sofia Tosoni, fr., Lake Oswego; Ema Kessler, so., Sherwood. How much screen time is too much for kids?